Blueprint Gaming makers of the great comic book tie-in Viz, and an effective adaptation of the classic Worms video slot game – have taken to the tried-and-trusted theme of bank robberies with their Cop the Lot slot. And if you’ve played Viz in particular you’ll recognize the fun and colorful themes on-screen. Cop the Lot has action over 5 reels and 20 pay-lines, with plenty of jolly graphics and icons. As well as the regular 9-through-Ace symbols – here presented in jolly primary colors – there are piles of cash, game logos, dynamite, safes, a policeman’s helmet and some inept-looking robbers filling up the reels. And with a wide range of betting starting at just $0.01, and three bonus rounds plus a progressive jackpot, there’s plenty to enjoy. The all-important Dynamite icon is the game’s Wild, substituting for all other symbols except the Scatters. 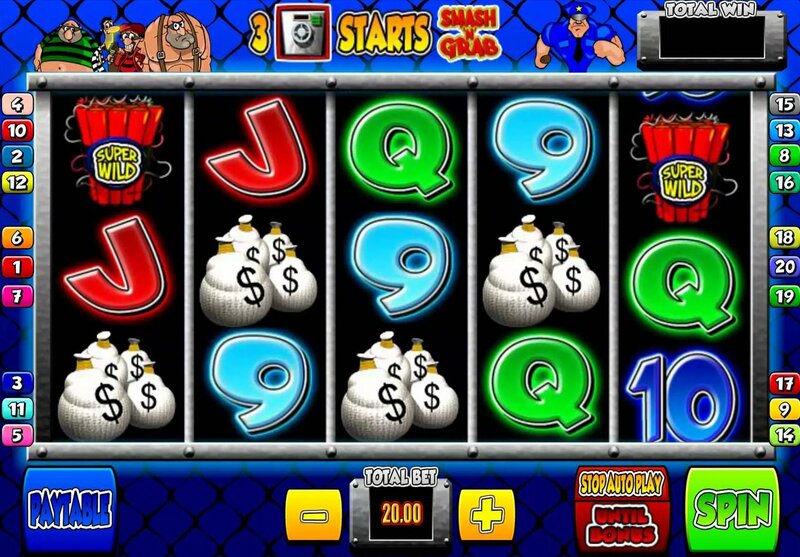 A 2x multiplier applies to any Wild win on this slot game. As we mentioned, there are three juicy bonus rounds to be had in this game. 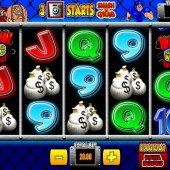 The ‘Cops and Robbers’ bonus is triggered by hitting three or more Policeman’s Hat Scatter anywhere on the reels. You’ll be transported to a nice little Monopoly-style game where your robbers travel round the game board picking up loot and bonuses while being pursued by the cops. Catch 3 Gold Safes and you’ll win the game’s Gold Jackpot, worth $1,000,000. If you get caught you’ll be hauled in front of the judge. If the jury find you Not Guilty you’ll get another bite of the board game cherry; if the jury return a ‘Guilty’ verdict, however, your turn will end. However, if you collect three keys during the round you’ll have the chance to win bigger prizes on ‘Millionaire’s Row’, with a 500x line bet jackpot up for grabs. Three or more Robbers Line-up icons anywhere will trigger the Usual Suspects feature. Essentially a Pick ‘em Bonus, you just have to choose from the suspects in order to reveal a prize and multiplier. A mega 500x multiplier can be yours, but choose the Gold Jackpot ticket and you’ll have your second way to win the million-dollar jackpot. Finally, hit three or more Locked Safe icons on the reels anywhere and you’ll hit the ‘Smash 'n' Grab’ feature. This is a straight free spins round where you get to pick your spins first. A special set of reels will be used, with extra Wilds and bonus icons included. If you’re a big fan of the 3D graphics featured in the games I’ve mentioned already in this review, you’ll probably want to steer clear of developer Blueprint Gaming's Cop the Lot. However, if you’re after some genuinely generous bonus rounds and great multipliers (not to mention the big progressive jackpot) you’ll love it. I did.